This 4 thread huck is similar to traditional huck which is normally woven on a multi-shaft loom. Plain weave should surround the blocks of huck to give the cloth structure, otherwise it will be very loose and open (unless that's the look you're going for). 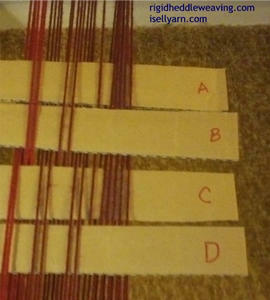 You will need 4 pick up (pattern) sticks and one "memory strip". The memory strip is not maniuplated, it is there only to make it easier to count slot threads during the pick up control. It's kept out of the way during weaving by placing it in the neutral position which is as close to the warp beam (or back beam, depending on your loom type) as you can get it. Each block consists of 4 picks. The first block uses pattern sticks A & B, the second block uses pattern sticks C & D. C & D are removed to enable picking the first (A/B) block and are re-inserted for the second (C/D) block. You can use stick A as a guide for inserting stick C. It will probably make life easier if you put string heddles on the threads for sticks C & D to make re-inserting them easier but, that's up to you. For the instructions as written, you will need at least 44 warp ends: 12 ends for the plain weave on each side of the huck and 20 ends for the huck blocks. Pick Up Control: Push the rigid heddle down to expose just the slot threads and pick up the threads as indicated. You will not be weaving with all 4 sticks in at the same time. This image is just to give you an idea of what the pick up sticks should look like and if you think of the sticks pictured here as the weft you get an idea of the weave structure. You can leave sticks A & B in and use them as a guide for C & D but C & D will have to be removed and re-inserted to weave their repective blocks. 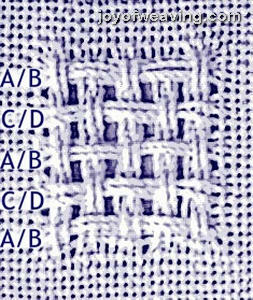 The bulk of the threads on the right side are where the plain weave is created. The "2 over-2 under" threads after that is what creates the floats for the huck. Frst, insert your memory strip and move it to the back of the loom. MEMORY STRIP: 2U, 2D. Repeat across. Pattern Stick A: 6U, 2D, 2U, 2D, 2U, 2D. Repeat across. Pattern Stick B: 8D, (2U, 2D, 2U, 10D. Repeat across). Pattern Stick C: 8U, (2D, 2U, 2D, 10U. Repeat across). Pattern Stick D: 6D, 2U, 2D, 2U, 2D, 2U. Repeat across. To make this a square, weave block 1, 2, 1, 2, 1 (A/B, C/D, A/B, C/D, A/B). It may not appear very "huck-like" while it is still on the loom. That happens later after the wet finish. If time permits, I will try and do a video and update this post. Enjoy!